The star in question is LP 40-365, a white dwarf located about 1,000 light-years from Earth. Like most white dwarfs it's small (8 percent as big and 14 percent as massive as our sun) and faint, but unlike most white dwarfs, it's moving at an outrageously fast speed of 1.23 million mph — nearly three times as fast as the sun. "It was immediately clear that this was no ordinary star," said study lead author Stephane Vennes, an astrophysicist at the Astronomical Institute of the Czech Academy of Sciences (AVCR) in the Czech Republic, to Space.com. "Its velocity is so high that it is on its way to leave permanently the Milky Way." Vennes' team decided to study 40-365 more closely over the course of two years through the use of the Kitt Peak National Observatory and the Hiltner Telescope in Arizona, the Gemini North Telescope in Hawaii, and the William Herschel Telescope in the Canary Islands. What they found shocked them. Most white dwarfs have atmospheres of hydrogen and helium, the most common elements in the universe — but 40-365 had an atmosphere of oxygen and neon, with traces of sodium and magnesium. "The unusual white dwarf LP 40-365 is unlike any other white dwarf," Vennes said. How did 40-365 become such an unusual star, moving at such high speed? Vennes and his colleagues believe that the star was the leftover from a Type 1ax supernova, which are poorly understood. Supernovae are the result of a star exploding, and there are several types. White dwarfs can go supernova when they are in binary orbit with another star. The white dwarf begins to siphon material from its companion — when it hits a critical point, the star's gravity overpowers the nuclear forces pushing its atoms apart, and it explodes in fantastic style. This is called a Type 1a supernova, and it is one of the most energetic events in the universe. Around 2002, astronomers noticed an unusual variant on Type 1a supernovae — they were similar, but only produced about 1 percent as much light. 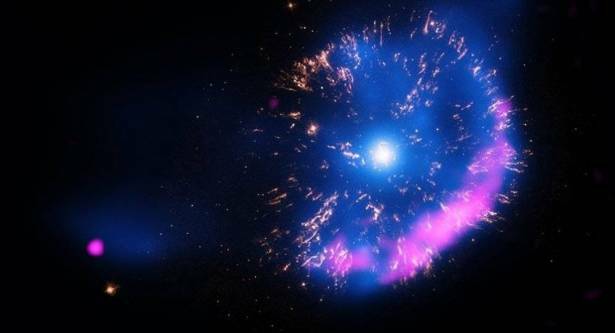 Researchers began to look into these phenomena and came up with a hypothesis: sometimes, a Type 1a supernova shoots the core of the white dwarf into space, creating in the process a new star from that core. The core is moving at very fast, since it was shot out at such speed, and it has a strange chemical composition since it has no surface. This phenomenon has been dubbed a Type 1ax supernova. LP 50-465's size and surface temperature are consistent with this hypothesis, according to Vennes. He hopes that continued observation may allow astronomers to better understand why some Type 1a supernovae become Type 1ax and others do not. "We believe this object is only the first among many that remain to be discovered," Vennes said. "The European Space Agency mission Gaia should deliver a large number of such candidates." Gaia is an ESA space observatory meant to discover and analyze hundreds of thousands of Milky Way objects. It launched in 2013.